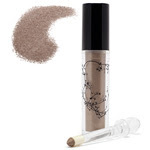 Beauty Professor: Rouge Bunny Rouge Caress of Mink Loose Glitter Pigment Preview! Rouge Bunny Rouge Caress of Mink Loose Glitter Pigment Preview! The love for Rouge Bunny Rouge continues with a quick visual preview of Caress of Mink Fire Drops Loose Glitter Pigment (049)! This particular product has been sold out for quite a while at Beautyhabit.com, but they were kind enough to supply me with a sample in my last order....this gesture has allowed me to share the warm radiance of this spectacular product. The Fire Drops Loose Glitter Pigment is extremely finely-milled and captures the light without feeling like traditional glitter. The formula contains a super high percentage of pearl, which will grant your eyes a marvellous shine and luminosity but with a weightless feel. We added Sodium PCA, a natural moisturiser that maintains the water balance of the skin, makes the texture soft and elastic and the application creamy and easy. A sponge-tipped wand enclosed in a practical bottle will safely keep the pigment inside and let it out only when you want it. Rouge Bunny Rouge Fire Drops Loose Glitter Pigment in Caress of Mink in direct sunlight, swatched lightly and heavily respectively. Its ability to convey a sophisticated shine is commendable. Rouge Bunny Rouge Fire Drops Loose Glitter Pigment in Caress of Mink photographed in the shade. Even without direct sunlight, the luminescent quality is present! Recently, Fire Drops Loose Glitter Pigment has been replenished at Beautyhabit. I have since received the product and will share a full review (with images of me using it on my eyes) in the very near future. In the meanwhile, I hope you found these swatches to be utterly useful!